Being comfortable in your own skin is no easy feat, no matter who you are. Brooklyn-based artist Ariana Page Russell, however, grew up struggling with a skin condition that extended beyond wavering self-esteem. Russell has dermatographic urticaria, also known as "skin writing." Simply defined, the condition inflames the skin as a result of the slightest contact, such as scratching, rubbing, or even hot water. The lightest of touches triggers cells to release histamines that causes physical symptoms similar to an allergic reaction. Any occurrence can take the form of puffy and red welts, leading mild scratches to resemble a serious affliction. In her condition, Russell discovered not only an unlikely artistic subject but an artistic medium as well. Russell developed a singular artist method, drawing deliberate patterns, messages and images on her skin and photographing the inflamed result. The bold artist inscribes everything from constellations to sailboats right on her flesh, letting her skin tell its story on its own terms. The viscerally striking images offer up a self portrait unlike any other, in which the artist and art truly converge. Russell's portraits, displaying an inspirational combination of vulnerability and courage, could teach most of us a lesson or two about loving our bodies and ourselves, not in spite of our flaws but because of them. We reached out to Russell to hear her wisdom firsthand. Were you interested in photography before you discovered working with your skin condition or did the two come together? I've been interested in photography for many years, and took my first official photo class in 1996. My photographs have always been about the human body, so it makes sense that I started photographing my skin. What exactly is your process? Is it ever painful? It never hurts, and is not painful (the area does get a little itchy sometimes though). I always like to make that very clear so people know I'm not inflicting harm on myself. What happens is I use a knitting needle or some other blunt object to trace a pattern or write text on my skin. Then in about five minutes the welts form and I make photographs. The drawings last about 30 minutes, so I need to work quickly. Back when I started this project in 2003 I was using film, so it was a little harder to make the photographs. I'd use mirrors to help me get different angles. Now with digital photography, I use a remote and tripod, and can see right away if the photos look good. 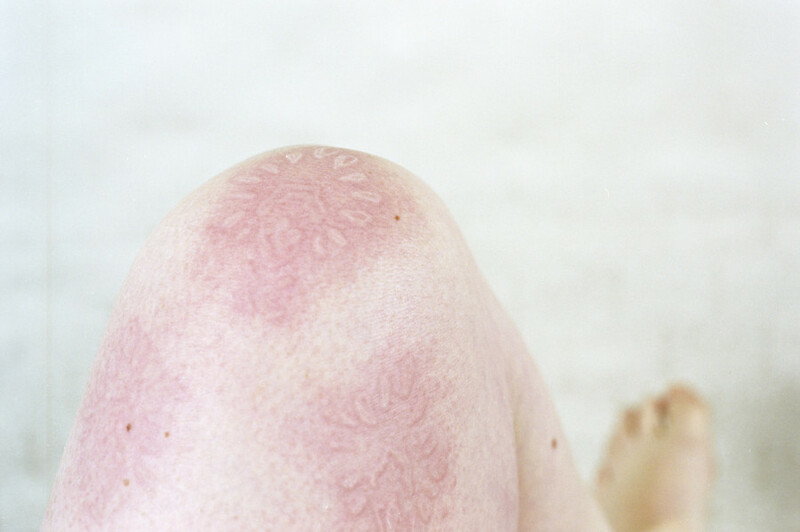 Do you see any symbolic meaning in your skin condition? Yes definitely! I've learned how to be comfortable with my skin and its quirks, sensitivities, and transparency. And not only that, but I've been inspired by it as well. I have dermatographia to thank for that! What do you hope to communicate with your artworks? I want people to see that having a skin condition doesn't make you a freak, and that it's possible to find inspiration and grow from your flaws. I also want the whole world to know about dermatographia, so if those of us who have it happen to get a scratch on the face, people won't say, "What happened to you?," because they'll know they're just welts. I'm spreading the word about dermatographia and forming a community of people inspired by skin on my blog, Skin Tome. Skin Tome celebrates sensitive skin, and acknowledges that having unique or weird skin is cool, inspiring, and something to be proud of. There's also tips for how to treat dermatographia and other skin conditions. I also make art that's not just dermatographia-specific. Lately I've been making new wallpaper designs, collages, and sculpture referencing skin. It's all about awareness and appreciation of our largest organ, and appreciation of our physicality as human beings. How do you feel about the media attention you've received? Do you ever feel your work is covered irresponsibly or insensitively? In general the response to my work is pretty positive, and I'm grateful for that. Recently there was a great article in The Atlantic written by Dr. James Hamblin that I think is one of the best things I've ever read about dermatographia and my work. He's very straight forward and clear, not making the condition seem like a freakish one. Sometimes the media sensationalizes my story, but not very often. There's been some weird coverage of my work from the UK, they're notorious for that. Which artists are you into right now? Some artists that I'm into are Laura Splan, Ernesto Pujol, Casilda Sanchez, Janine Antoni, Lia Chavez, Timea Tihanyi, Shaun Kardinal, Carrie Mae Weems, Wangechi Mutu, and Gabe Farrar. They all make figurative work and/or work that has to do with the body -- my favorite kind of art! See Russell's gorgeous artworks below and let us know your thoughts in the comments.